CC Pace had the pleasure of celebrating two very special service awards at our quarterly staff meeting. 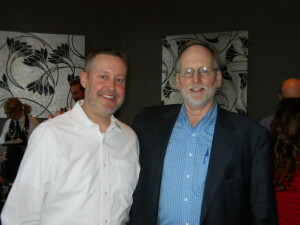 The first one went to Lee Minai, Senior Accountant, who was recognized for 10 years of service with CC Pace. Over the years Lee has managed the Account Payable/Accounts Receivable function, interfacing with our clients, subcontractors, and account managers with great precision and care. This was a bittersweet celebration for everyone as Lee is retiring to have more time to spend with her growing family, including five grandchildren under the age of 4! Her positive attitude, customer service and warm smile will be greatly missed by everyone – we wish you all the best, Lee! Philippa (Phil) Fewell, Managing Director of our Lean Agile Practice, joined us back in 1983 when we were known as Cabot Consulting. Over the last 35 years, she came up through the technical ranks managing and delivering financial and technology projects for a wide range of clients, from Fortune 500 to start-ups. CC Pace has had the privilege to be the beneficiary of the wealth of incredible skills and traits that are so admired by Phil’s clients and colleagues. Her versatile Agile experience includes serving as a trainer, coach, consultant, and project manager. Phil has been a role model for demonstrating integrity and excellence by looking out for both our clients and our best interest. And, we think everyone would agree that Phil’s contagious laugh and wit always seem to lighten things up around the office! To kick off summer in style, at the end of our staff meeting we held a barbeque! 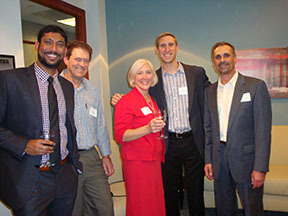 This event was not only attended by our current employees, but by several CC Pace alumni as well. 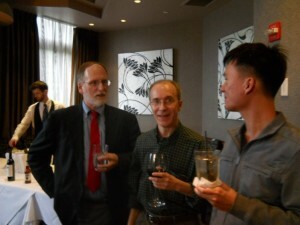 We enjoy staying in touch with our alumni and in many cases, have had the opportunity to work with them again. It’s always a good time to catch up with old friends, share some laughs and see what everyone is up to now. 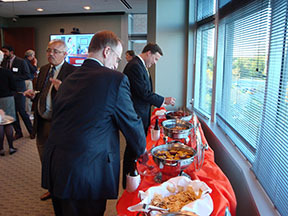 The menu included delicious summer favorites from Dickey’s Barbeque, festive drinks and desserts. And, of course no barbeque would be complete without some corn hole. We also had another game, and while you had to be here to fully enjoy it, all we can tell you is that it involved tattoos and a blindfold! Wishing everyone a happy summer! CC Pace President, Mike Gordon held a corporate staff meeting to review our previous year’s results and successes and introduce our business plans and initiatives for 2016. This meeting provided a great opportunity for employees to understand CC Pace’s strategic imperatives and the direction on where CC Pace is headed this year. 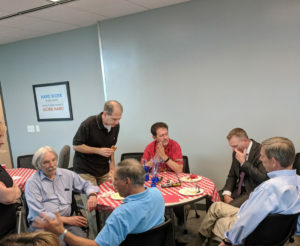 In addition, the corporate staff meeting allowed all of our employees to gather together and have some valuable face to face time with one another. On a daily basis, a large number of our staff are working remotely or at client sites and it is a rare opportunity when we can all be in one place. A highlight of the meeting was the celebration of Rechelle Card’s 10 year anniversary with CC Pace. 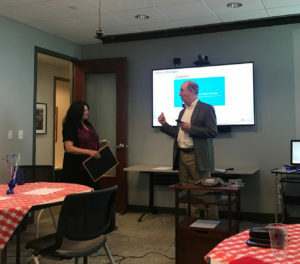 Rechelle, a Senior Technical Recruiter in our Staffing group, was recognized by Mike Gordon for the high value of service she has added to both the recruiting team and the company as a whole. 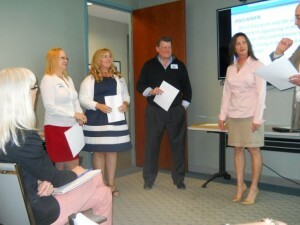 Mike presented her with a service award and the traditional CC Pace gag gift – which was the development of her own TV show “The Recruiter”, a spinoff of “The Bachelor” – it was quite a humorous skit which included several staff members in the roles of candidates and a rose presented to the “winner”. It was a “show” that is sure to be talked about for years to come! Once the meeting concluded, we moved downstairs to Ruth’s Chris Steakhouse, here in Fairfax Corner, to enjoy our annual party. The food was excellent as always at Ruth’s Chris, from the beef tenderloin, crab cakes and shrimp to the delicious desserts! 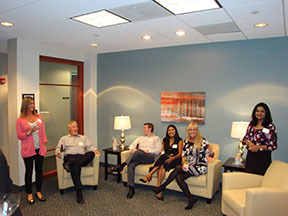 There was something there for everyone to enjoy while reconnecting with fellow employees and getting to know some new ones! 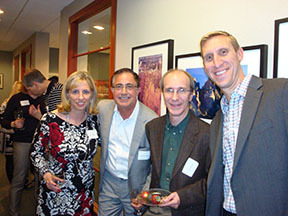 All our employees and their guests had a wonderful time and we all look forward to next year’s celebration! 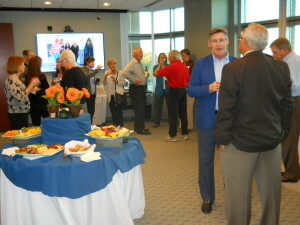 CC Pace hosted a celebration for our 35th Anniversary on October 15th at our headquarters in Fairfax Corner. The event was a cocktail reception where employees, clients, friends and CC Pace Alumni enjoyed cocktails and delicious hors d’oeuvres while reminiscing and reuniting. The highlight of the evening was a special presentation by President, Mike Gordon who explained how the company began, and the intriguing story behind the name CC Pace! 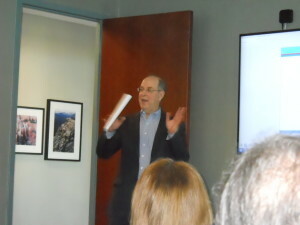 During his presentation, Mike took guests on a whirlwind tour of all the locations CC Pace had called home before moving into our current offices in 2002. 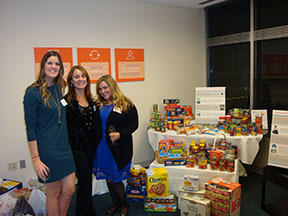 CC Pace choose to commemorate our 35th Anniversary by giving back to our local community by hosting a food drive for a local food bank with a goal to donate 350 lbs. of food. 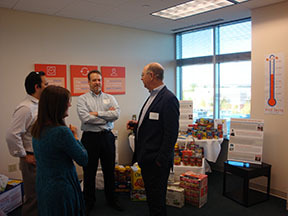 Through the generosity of all our employees and guests, we collected 451 lbs. of food for the Lorton Community Action Center! 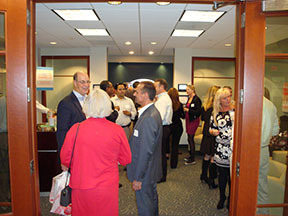 Seeing so many clients, friends and familiar faces in our offices that evening, we were honored to have been able to share such a grand achievement with so many who have played a part in our success! CC Pace employees took a break from their busy schedules for a Cinco de Mayo fiesta! This “holiday” is not Mexican Independence Day as most Americans think. Cinco de Mayo is the celebration of the Mexican victory over the French at the Battle of Puebla on May 5, 1862. Mexican Independence Day is actually September 16th. It just wouldn’t be Cinco de Mayo without Margaritas and luckily our Staffing Director had a spare Margarita machine we were able to use. The fiesta included authentic Mexican goodies brought in by our staff, including homemade Salsa Verde and Tres Leches Cake! 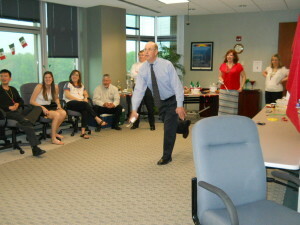 The event also incorporated some friendly competition during a Wii bowling challenge. The winner will remain nameless, but their victory may be short lived as there is talk of a rematch in the near future. Before heading down to Ruth’s Chris for our Annual Winter Party, CC Pace President Mike Gordon spoke at our corporate staff meeting and rolled out our business plan and new initiatives for 2015. 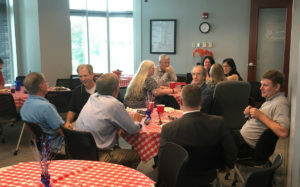 Our corporate staff meetings give us an opportunity to bring employees together from our main office and various client sites to share what is going on with CC Pace and provides a great time to catch up with colleagues. 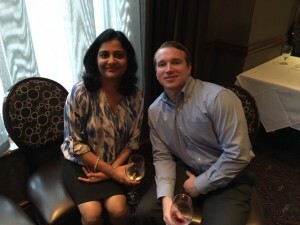 Immediately following our Staff Meeting, we headed downstairs to Ruth’s Chris Steakhouse, conveniently located on the first floor of our building. 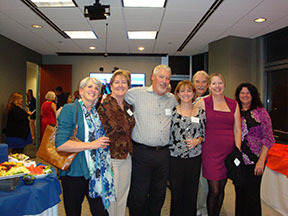 Our Annual Winter Party is a rich tradition that began at CC Pace years ago. We once held our parties in December, renting out ballrooms at local hotels and other venues for the event. One year, a hotel lost our reservation and we had to hold the party in later months. The holidays are a very busy time of year and we found that having the party in the first quarter of the New Year actually served us well. 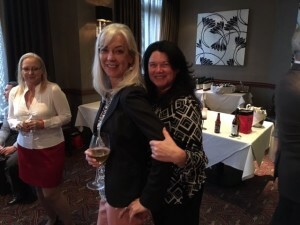 Generally, there is less going on during this time of year and things are less hectic and we found that people enjoyed the new timeframe and we had higher attendance as a result. 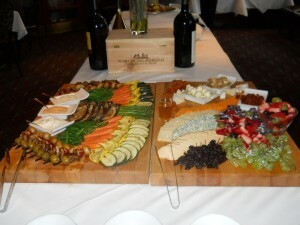 Big hits at this year’s party included seared tuna, beef tenderloin, sliders, and a great selection of decadent desserts! 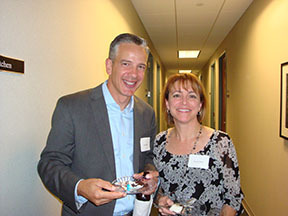 It was a great evening to share with employees and their spouses. 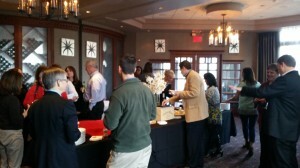 The planning was done by our very own Staffing Manager, Laura Campbell, who did a great job of organizing the event. We are already counting the days until next year’s party! Jason and Clay kicking off our annual party! 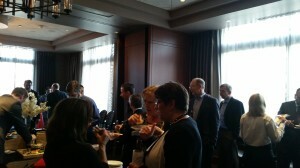 Everyone enjoyed great food and conversation!